Coffee. It's not just for breakfast, lunch and dinner anymore. 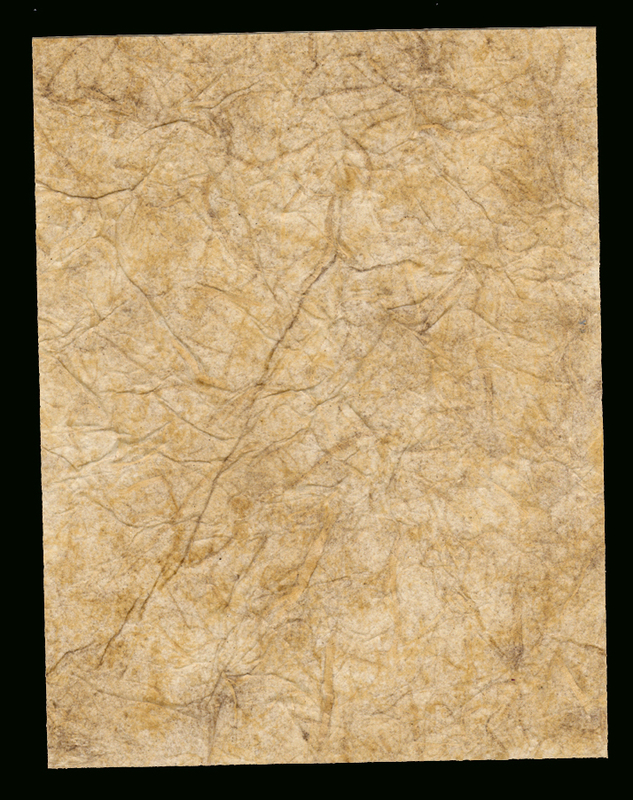 It's also for making lovely background papers for your cards! 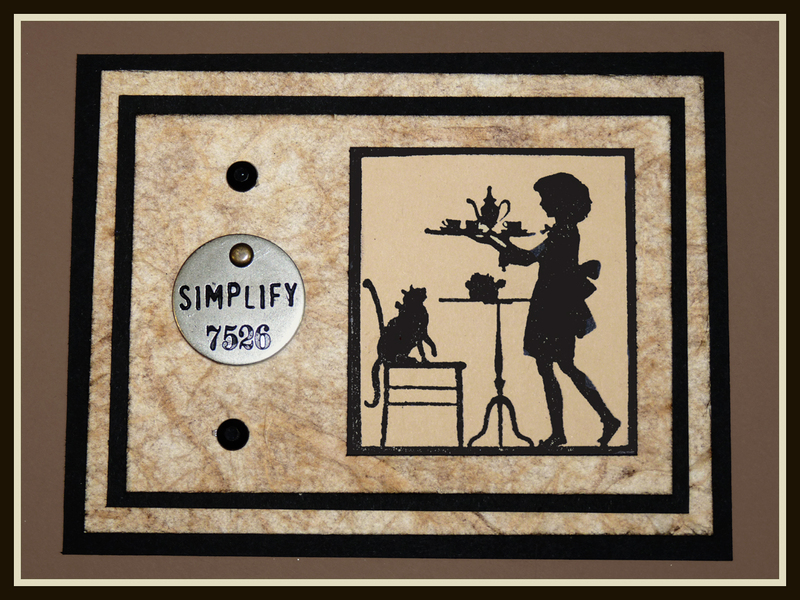 This is an easy, sort'a messy process that will give you a gorgeous antique distress. Bonus: It smells good, too! 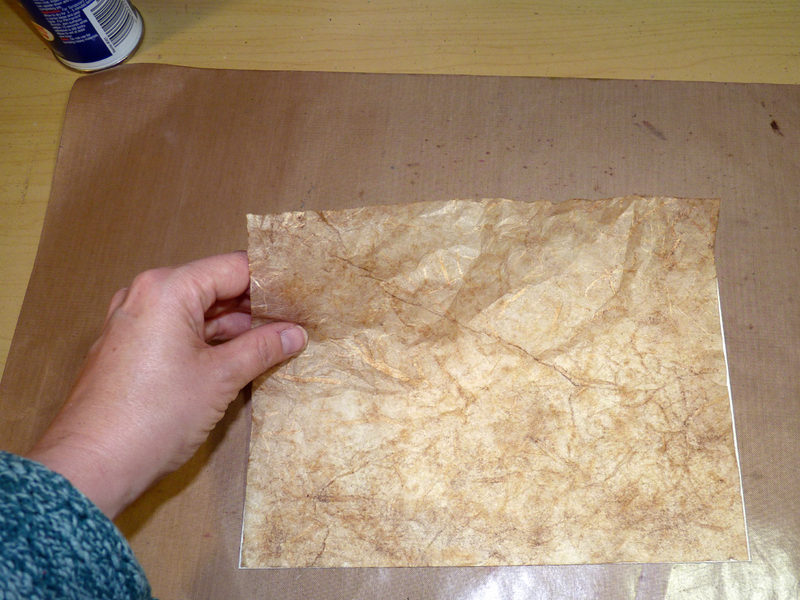 I used mulberry paper because it can withstand being saturated with water. 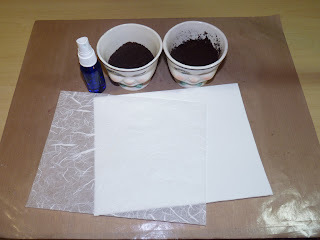 Canvas (regular or sticky-back) and other natural fabrics would also work. Twodifferent grinds of coffee make for more variety in your stain patterns, but if you only have regular grind, it will work, too. Generally, the finer the grind, the deeper the stain. Same goes for "the darker the roast..."
Begin by placing your mulberry paper on your nonstick craft sheet and dampen it with water. It should be uniformly wet, but not dripping. 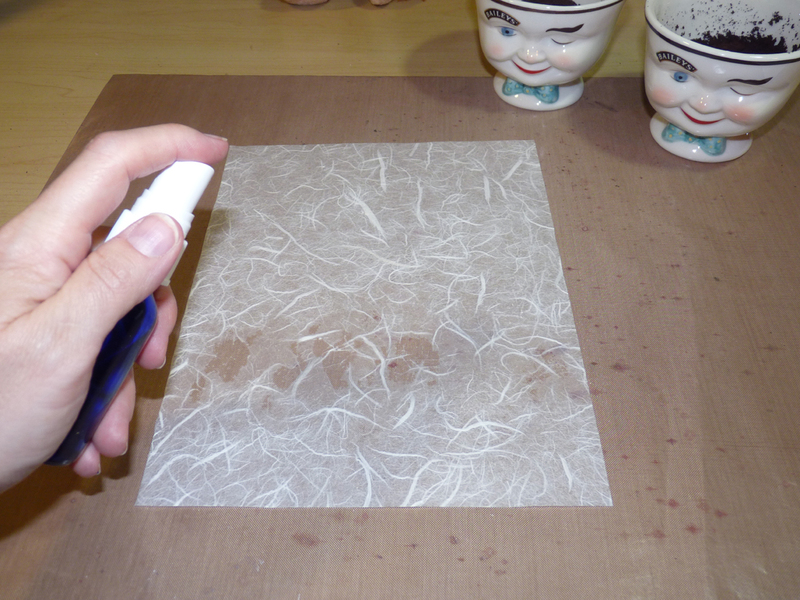 Pre-wetting the paper helps the stain to "take" better. Sprinkle the ground coffee all over the wet paper, being sure to vary the thickness of the grounds. The paper should be almost completely covered. Mist water over the ground coffee. Hold your mister bottle far enough away that it doesn't blow the coffee grounds all over the place (voice of experience here). 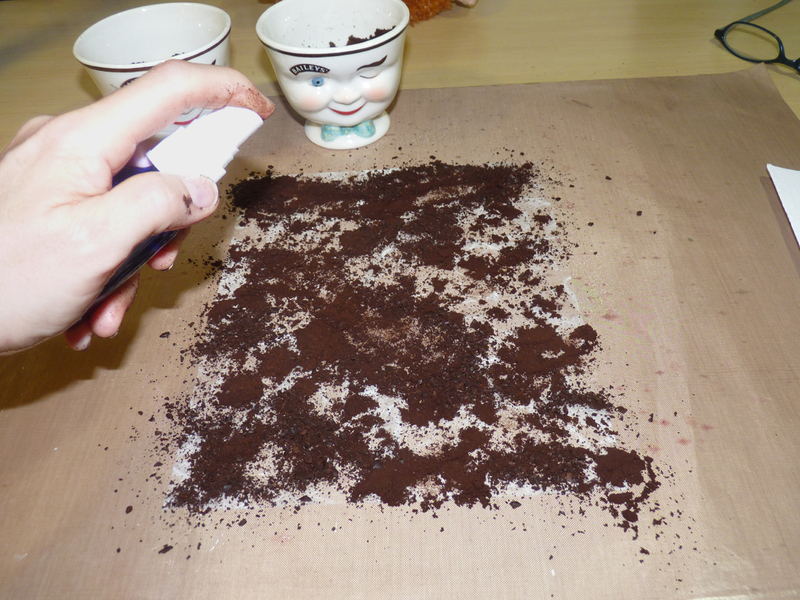 Very, very gently press the damp ground into the paper. Already, you'll see the stain beginning to seep into the paper. Okay, it's Break Time! Let this dry completely. It will take several hours, or ideally, let it sit overnight. 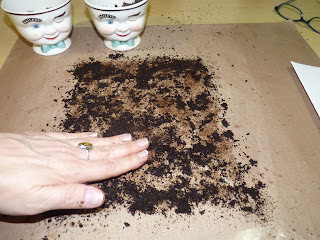 Once it's bone dry, gently brush the coffee grounds from the mulberry paper. Use your hand or a soft brush and keep going until you can no longer feel any grittiness. 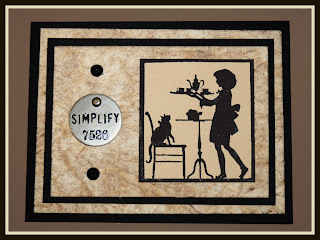 To really allow the color variations to show up, adhere your coffee-stained mulberry paper to a piece of sturdy white cardstock using the adhesive of your choice. I used a high-tack spray to avoid curling the cardstock, but Matte Multi Medium would work, too. 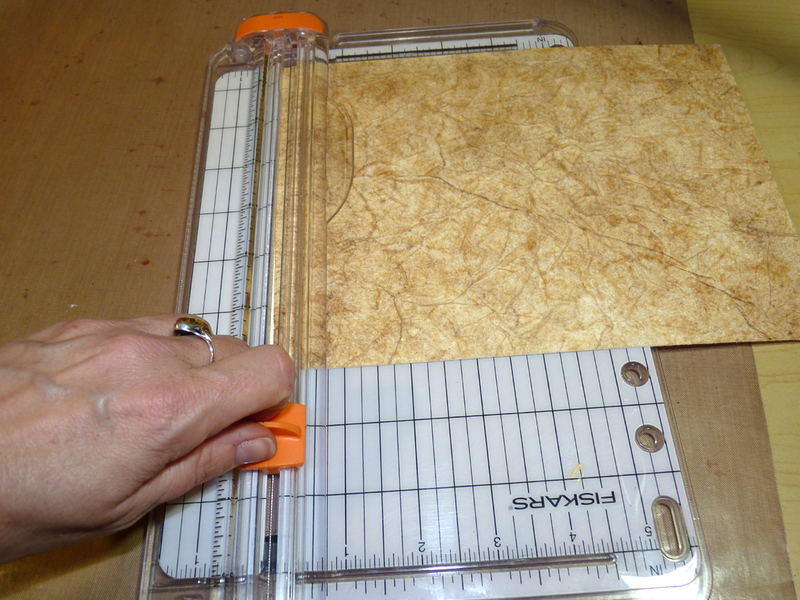 Press the mulberry firmly onto the cardstock, and don't be afraid to let it wrinkle a little. 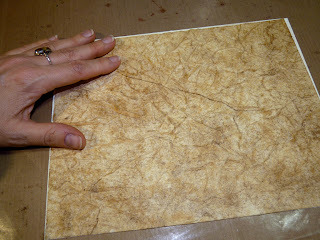 This will give the piece a really cool texture. 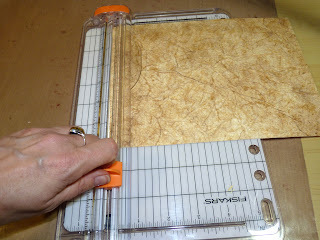 Trim any uncovered edges with your paper trimmer. And, voila! 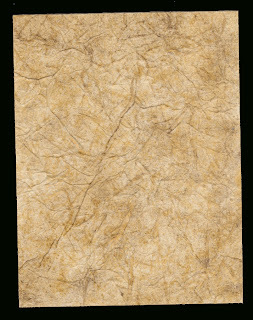 Coffee-stained paper, ready for your multi-media masterpieces! Have a wonderfully caffeinated day! This looks good, everything to do with coffee is good! Recycling at its best after all, once the coffee grinds have worked their magic then you still use them for something else!!! Thanks Linda! A really great tutorial and oddly enough my younger daughter who's doing a fashion degree did something similar to a man's shirt for a fashion shoot which her tutor liked so much he said he wanted it! Love how the mulberry paper looks from this technique! Thanks for the tutorial! Will have to try this out! what a great technique. 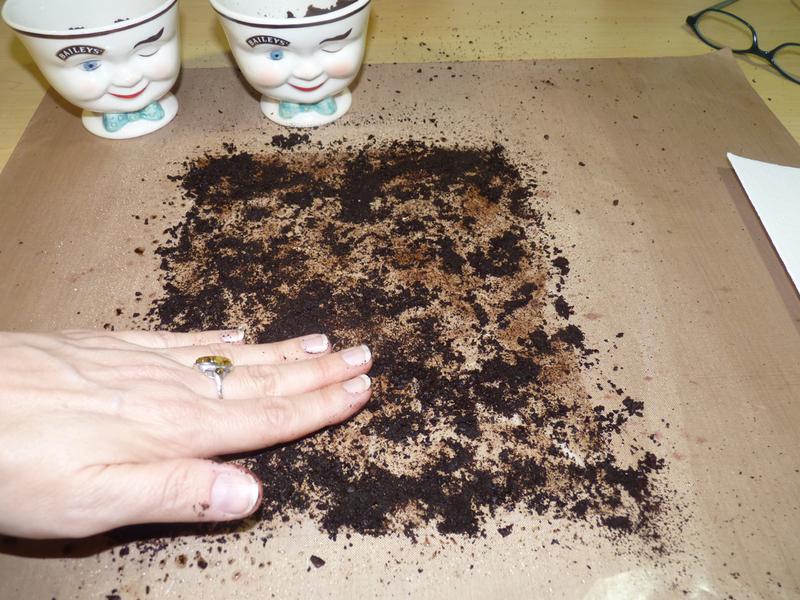 I love the coffee grounds effect on the mulberry paper. A great tutorial Linda! Drying overnight is important, that's where I went wrong on mine. Your card is beautiful, as always. What a great technique - it turned out beautifully! Awesome technique Linda, but I just couldn't do that to my beloved coffee!!! 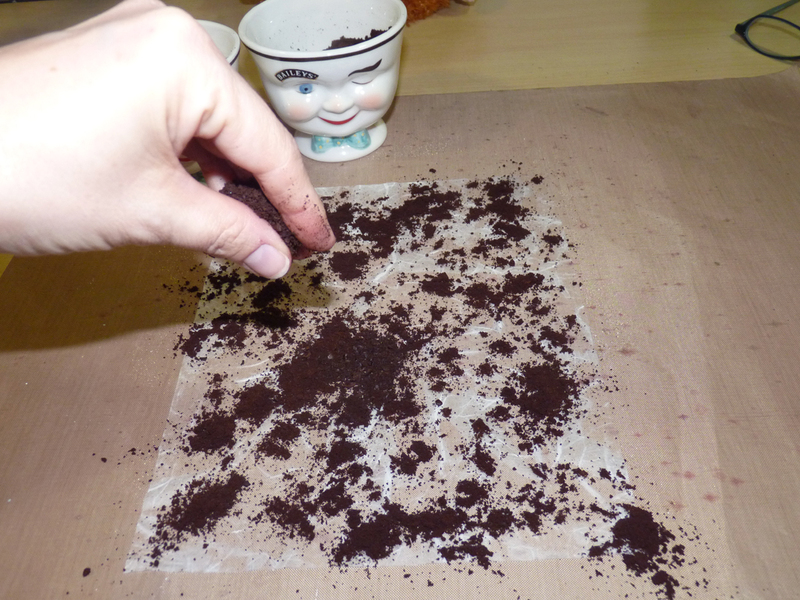 So sorry, I just use instant coffee and get the best result I can. I have also only used cardstock. 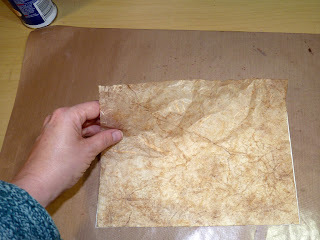 I will try it with mulberry paper next time and perhaps it will look even better. I also love how you used the background paper in the card. It is lovely!!! A day without caffeine is nighttime!! !